The fair signals a plateau in the rise of art in Southeast Asia. 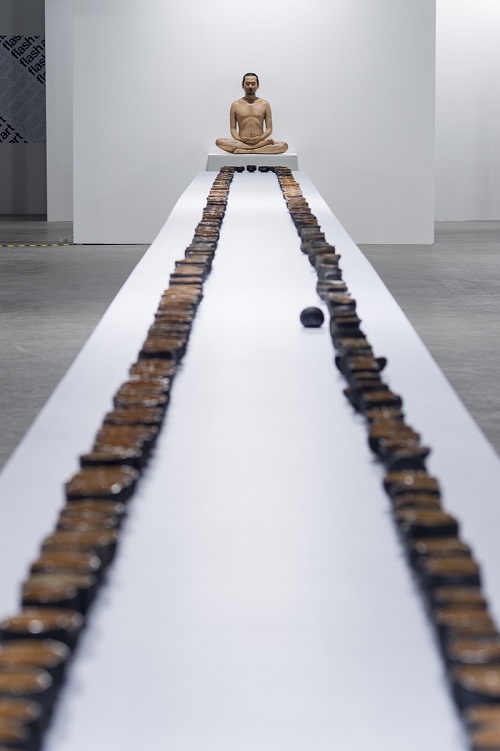 Visitors to this year’s edition of Art Stage Singapore would have seen an artwork by Thai artist Kamin Lertchaiprasert — a wax figure of himself seated in a meditative position. In front, Raku tea bowls are lined up on a platform, almost running the length of the hall, and a painting of a circle marks the end on the opposite side. Renowned for his public artworks, Kamin undertook a project on home soil last year, specifically with the Bangkok metro system, where all advertisements were replaced with his works. His statement for the project particularly resonates within the landscape of an ever-evolving Southeast Asia. “Something is missing in Thai society … There is a lack of humanity, a lack of value for our roots. It’s gone,” he said. One cannot help but ponder that observation amid the impressive development in Singapore. From the moment we touch down at Changi Airport, and on the journey to the city, there is no shortage of reminders of the city state’s meteoric rise to world-class status. Its neighbouring countries may not be quite there yet, nonetheless, fast-changing is an apt description for Asean on a whole. That said, it does not mean that Singapore has eschewed art development and cultural preservation in pursuit of development. Indeed, the government has determinedly made it an arts hub for the region, with a much-envied infrastructure and funding system. In fact, we were there for Singapore Art Week 2018, an annual event organised by the National Arts Council, Singapore Tourism Board and Singapore Economic Development Board for the last six years. Art Stage Singapore is its anchor event. 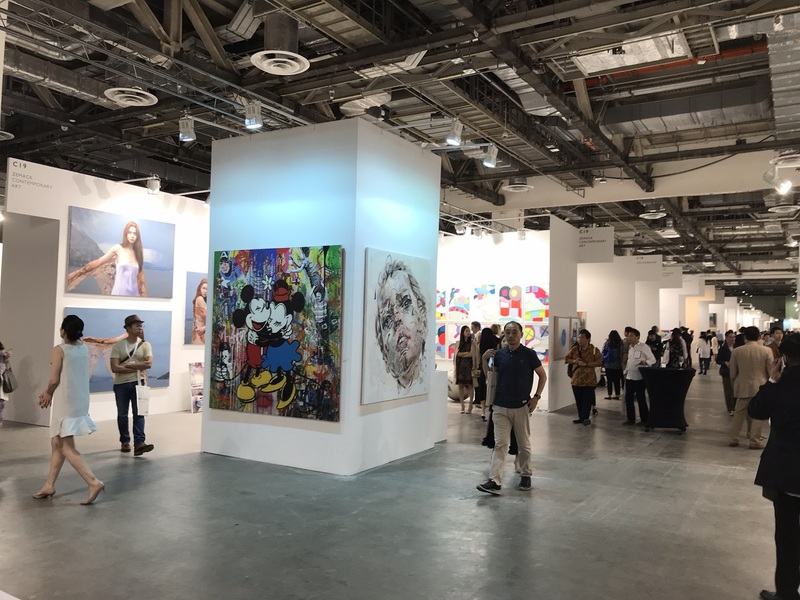 But this year’s Art Stage has revealed that structure and support is only one half of the equation as a down-sized fair — 83 galleries participated compared with last year’s 131 — drew flak and concern. It is understandable if one considers how founder and director Lorenzo Rudolf has branded the fair the de facto platform for Southeast Asia since its inception eight years ago. Fast forward to 2018, Rudolf’s somewhat embattled response to a shrunken fair was much reported in the regional media, where he rather ungraciously — some think — placed the blame on Singapore’s stagnant art market, claiming it was not only caused by a general economic slowdown but, more critically, that there is a lack of growth on its art scene. “It’s always easier to build infrastructure than to build an art scene. What we need here is not only a state-financed system, the struggle and difficulty is to develop the free market, the private sector, to grow that. Collectors come to the fair once a year, but not regularly. That means galleries here mainly survive based on the local market alone, and that’s not growing, not in art production … if you look at the galleries, like in Gillman Barracks, half the galleries are either closed or struggling,” says Rudolf. Coupled with that is the growing competition from other Asean countries. “When we started in 2011, Singapore was the only place with infrastructure in place, stability and a vision. Today, the gap between it and countries like Indonesia, the Philippines, Vietnam and Thailand … is smaller. Galleries are growing, museums are opening, artists are heading out, they have strengthened,” he observes. Indeed, there was a distinctively smaller presence of Southeast Asian galleries (excluding international galleries with local presence), and Rudolf candidly points out that among other reasons, the cost of logistics in Singapore and contrastingly, the lower price level of artworks for most Southeast Asian artists, make participation not worthwhile. Where does that leave the art fair? Certainly, the organisers need to bear some responsibility, though the fair director insists that the entire system needs to be reflected on. Yet, all is not lost. The three Malaysian galleries that have been participating over the years — Richard Koh Fine Art, G13 Gallery and Wei-Ling Gallery — were happy with the response they received at the least. Once again, Richard Koh had a successful outing, with famed Thai artist Natee Utarit taking a prominent spot with a special exhibition of his new series of works, Untitled Poems Of Théodore Rousseau. Koh, who represents the painter, admits that Natee’s works sell. Riding the fair’s choice to focus on Thai artists this year, Koh also presented new works by Kedsuda Loogthong while choosing to showcase works by Malaysian artists, such as Wong Perng Fey, Justin Lim, Minstrel Kuek, Nadiah Bamadhaj and Davinder Singh, in rotation. Also opting to show a group of Malaysian artists is Wei-Ling Gallery, which brought works by Cheong Kiet Cheng, Rajinder Singh, Anurendra Jegadeva, Choy Chun Wei and Chin Kong Yee. A metal sculpture by Pakistani artist Amin Gulgee was also displayed. On the other hand, G13 gallery owner Kenny Teng — who also showed four artists — felt that collectors were definitely more careful and selective this time round. He also observed that not enough younger collectors were coming in. 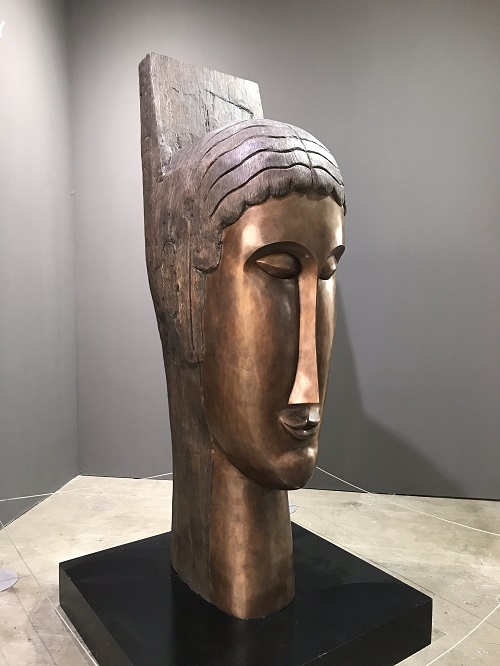 In terms of Southeast Asian representation, Teng says, “For a Southeast Asian art fair, the presence and works are not that strong this time.” Nevertheless, he adds that while galleries have options to go out to Hong Kong, Taiwan or even South Korea, Art Stage is still a friendlier platform for artists from the region. 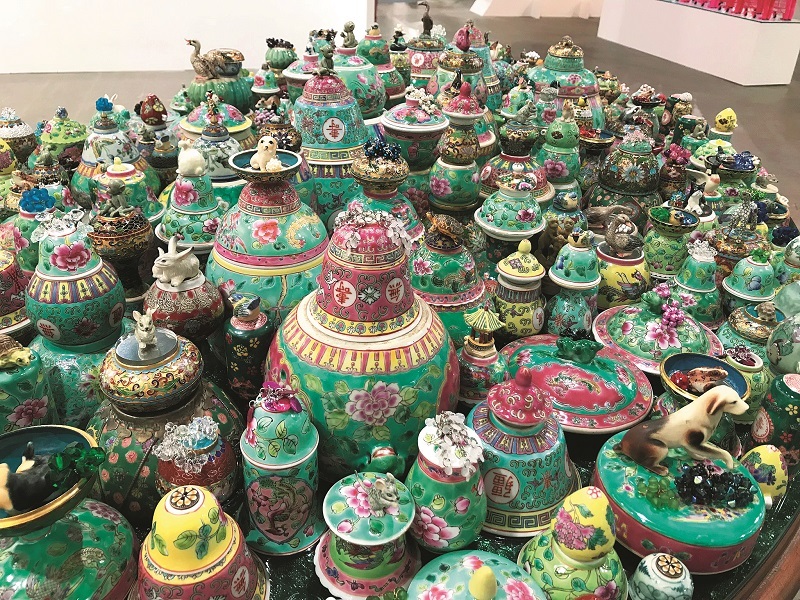 In her write-up for Blouin Artinfo, American journalist Tina Xu, who visited the fair for the first time, said the Southeast Asian art market is one still in search of its rhythm. One cannot help but agree. Philosophical as it may sound, art gives visual expression to the intangible. And at a fair like Art Stage, people perhaps seek a language, an understanding. In this case, it signals a lack of cohesive voice coming out from art in this region. Art Stage Singapore took place from Jan 26 to 28, 2018. This article first appeared on Mar 5, 2018 in The Edge Malaysia.